BEADS for Education is an organization dedicated to improving the status of women in Kenya through women's business development and girls education. Working closely with AWF, BEADS developed a successful Maasai women's cooperative in 1993. Today, the Dupoto Women's Group makes beautiful hand-crafted beaded products which include dog collars, bowls, coasters, and many other unique items. Traditional Maasai jewelry is also promoted. These products are often the only source of income for the women who support more than 125 children. Given poverty levels and overly stretched public budgets, and growing pressures on wildlife throughout Africa, the need for continued support for wildlife education and training initiatives is perhaps greater today than ever. And so, AWF continues its strong tradition in this area. This work is perhaps best exemplified by AWF's Charlotte Fellowship Program. With only 300 African wild dogs (Lycaon pictus) left in Kenya, the African Wildlife Foundation (AWF) and our partners are working diligently to mitigate the key threats to this important carnivore. Research on this highly endangered predator is conducted in parts of Laikipia, Samburu, Isiolo, and Baringo districts in northern Kenya, a landscape that AWF calls the Samburu Heartland. This area contains a mosaic of land-use types, including pastoralist areas, commercial livestock ranches, areas devoted to wildlife-based tourism, small-scale farming, and protected areas. President Kagame, wildlife authorities, conservation groups, and residents of Rwanda came together on Saturday for the naming of 30 endangered mountain gorilla babies (Gorilla beringei beringei). There are only 700 mountain gorillas surviving in the world, and 380 of them are in Rwanda. For Rwanda and its people, conservation of mountain gorillas is more than simply preserving one of the world's last great ape species. 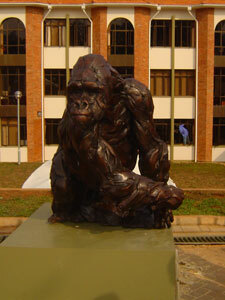 The gorillas are the country's main tourist attraction and have become perhaps the country's greatest icon.